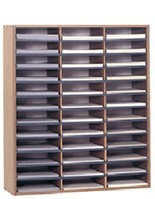 This 12-pocket countertop paper storage is made of metal for a durable and long-lasting literature holder. The brochure display is great for use in retail shops as an organizer for periodicals, instruction booklets, or specialty cardstock. 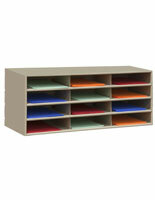 The paper storage for office use is ideally placed in break rooms or other communal areas as a place to keep mail and documents sorted. 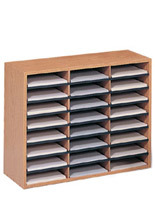 The literature holder can also be used in homes as an organizer for many things, art supplies, homework, bills, and more. 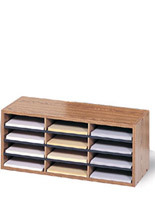 The storage is designed to fit on counters or tables with a dozen slots that hold periodicals and brochures up to 8.5” wide. The black display is able to fit in to many settings because of its neutral color. 33.8" x 14.3" x 11.7"